UPPER WEST SIDE — Locals sounded off about a planned 20-story nursing home development on West 97th Street at a public meeting Tuesday night, raising concerns about the extent of the project's environmental review. In May, the New York State Department of Health ordered developer Jewish Home Lifecare to conduct an environmental review of the project before any construction, slated for fall 2014, could begin. Opponents claim the state's decision to require a review came after a private study found high levels of lead in the soil around the development that could potentially permeate the surrounding area during construction. Hundreds packed the auditorium of P.S. 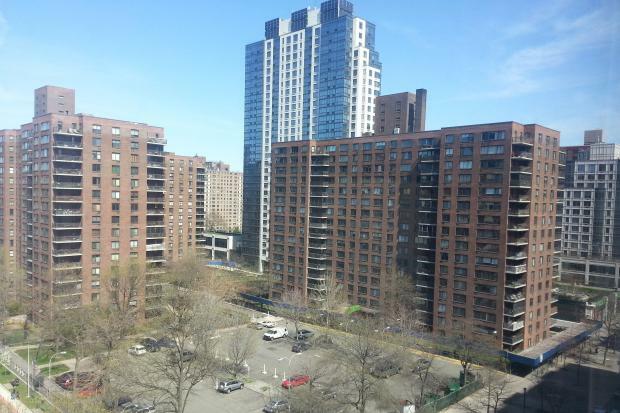 163, a school neighboring the development site — currently a parking lot between Amsterdam and Columbus avenues — Tuesday to express concerns about the negative health, safety and environmental effects the $250 million complex could have on the neighborhood. The meeting centered around evaluating whether the environmental review planned by JHL, which it will conduct in the coming months, goes into enough depth. It also provided the chance for residents to share their opinions on the project with officials from the Department of Health who listened to hours of testimony. The environmental review, as currently outlined, will consider topics like the use of hazardous materials in construction, the project's impact on local transportation, noise, air quality, and sewer infrastructure, among other issues. However, topics like the use of natural resources or the effects on open space will not be considered — something community members fought back against. "This document is decidedly pro-development," said nearby resident Jean Green Dorsey, claiming the review as currently outlined didn't go deep enough into issues like waste management and the need for backup generators related to the project. Many, including Dorsey, spoke of a feeling of fatigue after years of construction that created the nearby Columbus Square development. "We know stuff has to change. We cannot be overwhelmed, overburdened any further," she said to a round of applause from a crowd very much against the new development and worried about the new building's impact on light, open space, noise and congestion. Others urged state officials to be thorough in their environmental review. "I commend to you the requirement that we have a rigorous hazardous materials discussion," said Mark Diller, chair of Community Board 7, who also focused on the discovery of high levels of lead. While a significant portion of those in attendance were from the affordable housing development Park West Village, from which a strong opposition group has formed, there were also a group parents from the nearby school P.S. 163 at the hours-long hearing. "Students will be subjected to decibel levels that will make it impossible to hear their teachers," P.S. 163 parent Avery Brandon said. "Perhaps we should have simulated construction noise and then tried to hold this meeting." Bruce Nathanson, a VP for JHL, began the hearing by reminding the audience that his company has been on the Upper West Side for 128 years and considers itself part of the community. "Jewish Home welcomes this public process," he said, citing the meetings it had held with P.S. 163 parents and administrators since 2009. JHL is pushing for the project because it said it will allow it to establish new, modern types of senior care and "replace Jewish Home’s outdate nursing home," which currently sits on West 106th Street. The project, which would provide 414 beds, was approved by the City Planning Commission in March of this year and needs state Department of Health approval on the Environmental Impact Statement to proceed. Members of the public can view the environmental review proposal here and submit their comments on it to dhfpdivoffice@health.state.ny.us.